Six minutes of high flying action with Portuguese rider Bernardo Jerónimo, going ham all over the world. 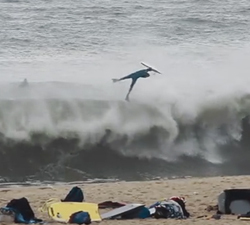 The latest drop from portuguese shredder Bernardo Jerónimo, charging in Nazare, Ericeira and more! From Timelapse-Media. A collection of footage featuring Bernardo Jerónimo, bodyboarding during last Autumns season in Portugal. From Timelapse-Media. The first instalment edited by Bernardo Jerónimo himself, featuring action from Portugal, Brazil and Chile. Video profile of portuguese rider Bernardo “Xouriço” Jerónimo, shot entirely in his home of Portugal. From Ruben Cabral.